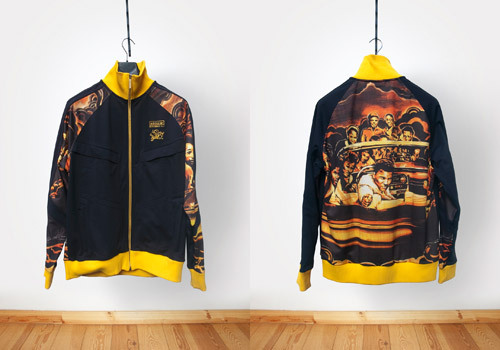 Heavyweight (aka HVW8) designed this warm and friendly adidas jacket as part of the Muhammad Ali Values series to represent the idea of ‘Giving’. The colorway is what gives this track top its true uniqueness and open feeling. Largely black, the polyester top is brought to life by the bright yellow neck collar, sleeve cuffs, and waistband. All four front pockets stay full black to keep the front as clean and straight forward as possible. Panels that start at the neck ride down the front side of the shoulders and travel along the sides of the sleeves depicting faces of smiling people, painted in yellows, oranges, and browns. Black side stripes run down the tops of the sleeves, so well concealed that it wouldn’t be immediately evident this is an adidas release if it wasn’t for the bright yellow embroidered logo on the left breast, under which stands the stylistic HVW8 signature. The back of the jacket is a masterpiece, not unlike the other track tops in this series, yet still completely unique in its own right. 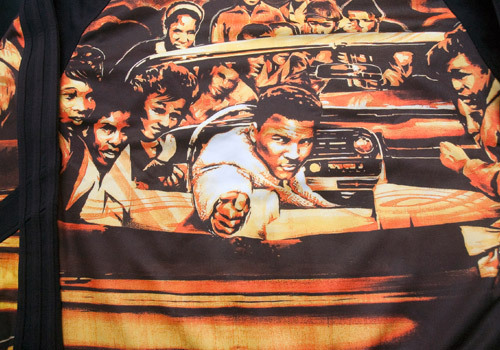 A large, overall print shows a painting of Muhammad Ali in a convertible car, surrounded by a crowd of happy people. The feeling of the image is friendly, exciting, inviting, and this is due in part to the warm color palette chosen by HVW8. 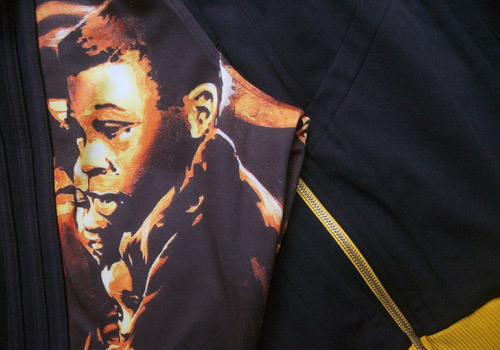 As with all of the Muhammad Ali Values jackets the zipper is specially made to match the colorway, with its side tape done in bright yellow, and the chain and pull tab made of gold colored metal. 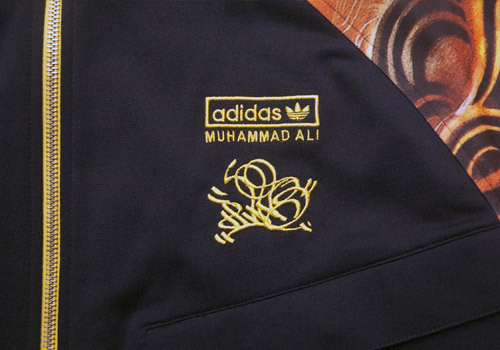 Etched in the pull tab is Muhammad Ali’s signature and the adidas trefoil logo. HVW8 also designed a pair of Stan Smith’s and a t-shirt to compliment this Muhammad Ali Values Giving TT. Hey Sonia, we contacted you back as well to let you know that we do not officially sell any clothing but can put you in touch with the collector who owns this item. If you’re still interested please shoot us an email. Hello guys! I’m a huge fan of Muhammad Ali, I collect every clothings of him as far as possible. But the problem is – as we all know – the clothes are extremely rare and limited! That’s what makes me sad a bit, so I would like to know if you can show me addresses where I can buy this kinda stuff? I’m hopefully waiting for your answer and thank you anyway!